Wednesday night was date night… we went to Olive Garden. I have been making a habit of looking at menus online before we go out to eat, looking at the nutrition so I can plan out what I want to order ahead of time… and so that I can choose ahead of time to be healthy. It’s a lot easier going in with a plan, then trying to be healthy on the fly. So, I narrowed it down to two options: one of Garlic Rosemary Chicken (one of the light options) or Stuffed Chicken Marsala. I decided, going in, that if I got the Chicken Marsala, I could eat half of it. So, one salad, one bread-stick, and one half of my entree later, I was happy. (I took the leftovers to work for lunch today.) Our date was not only free (thanks to gift-cards from family! ), but fabulous. 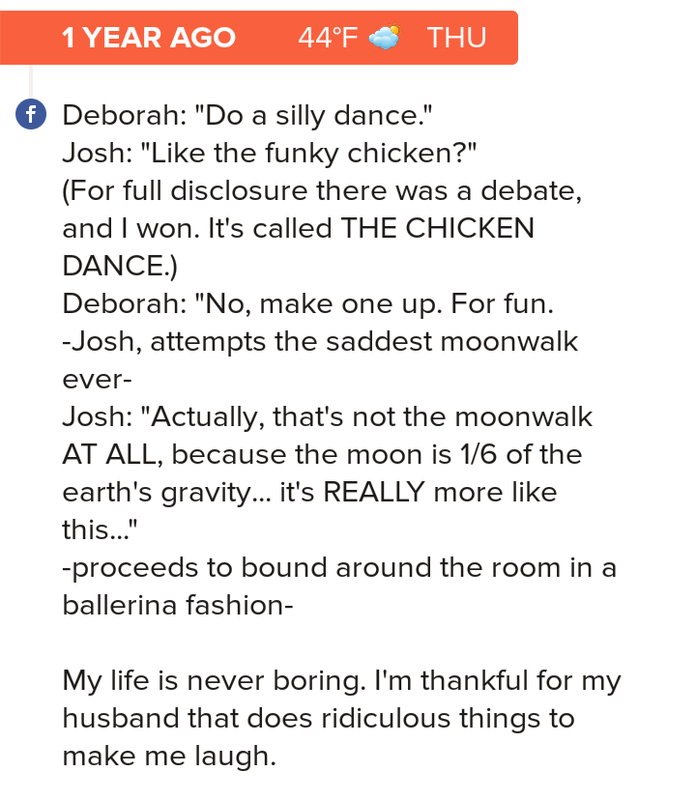 We mostly talked about what classes Josh was thinking of taking next semester. After Olive Garden, we went to Walmart. No, this may not be exciting to most… but I NEVER go to the store anymore. You have no idea how much I want to do the grocery shopping. Why did we go to Walmart? To get folding chairs. Like the type you take camping… because we’re going to use them to sit on our front or back porch and read. Now I realize this may be a little redneck…. but we’re poor (not really, but all extra money goes to the loans so kinda). Anyway, we have this wonderful back porch, and plans to buy plastic chairs for it, but we wanted chairs NOW. So, we sprung for chairs that can fold up and go to the beach. After that, we headed to Chick-fil-a for ice cream (because, date night), and took some home to Aaron. THEN WE WATCHED 24. We have one episode left in 24. Ahh. We have an understanding that after we finish 24, we’re going back to The West Wing for a bit. The weather has been gorgeous this week. We’ve been sleeping with the windows open, and I have been reading outside during lunch. I LOVE it. However, it’s also been hard. I’ve mentioned my hyperhidrosis before, but it gets so much worse in the heat. Maybe I’ll write more on that later… but right now I am just uncomfortable in my own skin, and not saying nice things to myself about it. A few positive things I can say, are that I have found some products that have helped me cope with the obnoxious sweating, including flip flips that I’m not sliding in (revolutionary for me) and inserts for my shoes. We are in the thick of the Disney countdown! I have been a Pinterest maniac: looking up tips, the best places to eat, what to pack… I’m so ready. This weekend, Josh and I have to do our Taxes (bleck) but we’re also going to start looking into FastPasses and such. But first, we have a second date night this evening. It is a night of our favorites: Moe’s and the drive in movie theater. We’re seeing the new “real life version” of Cinderella, and some Disney movie about sports (obviously we’re going for Cinderella). So, plans for the weekend include: date tonight, church meeting in the morning, taxes, fun (probably a movie, board games, and BBQ chicken sandwiches), finishing 24, church, and game night with friends! I am so excited about our weekend, even if the Zoo plans got rained out. I’m excited because you are staying with me ALL SATURDAY LONG. Not only that, but we have TWO DATES in ONE week. I am just soaking up the love like a sponge. Thank you for working so hard to rearrange your schedule to have max time with me! Maybe we can sit out in our new chairs and read on Sunday? Timehop tells me I was depressed this time last year. Apparently, this happened (see below) and I’m glad it did. I remember last year being so hard, and being so beat down by the crazy lady. Hopefully, as those wounds heal I can remember how awesome you were though it all… and start to focus on the positives of those early days, rather than the days of unemployment, and then emotional/verbal abuse when I was finally employed.